November 20, 2017 – This week — just in time for Thanksgiving in America — we set sail with the intrepid Pilgrims on The Mayflower. Once aboard, we’ll meet the Winslow family, and gain a perspective that links the broader experience — from Native American contacts to intrigues back home in Europe. 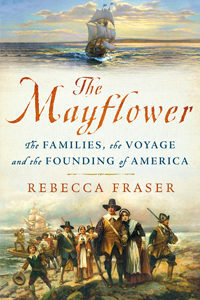 Tracing the voyage with us is reviewer and broadcaster Rebecca Fraser author of The Mayflower: The Families, the Voyage, and the Founding of America . The daughter of noted British historian Lady Antonia Fraser and former president of the Brontë Society in the U.K. Her previous books include The Story of Britain . You can find her on Twitter at R Fraser Author.